With the wealth of genealogical information available online nowadays, it is easy to overlook offline sources for our research. But the amount of information online - large as it may be - is only a fraction of what is available to us offline. 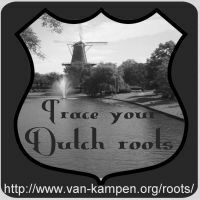 The topic of the feature article in the April issue of the quarterly Trace your Dutch roots newsletter is Offline Dutch genealogy. The article discusses topics like doing research in The Netherlands, genealogical collections, literature research, and family papers. The newsletter is due later this month. Subscribe now if you want to receive the newsletter by e-mail. Previous newsletters are still available at the newsletter archive.